Despite H's persistent efforts to broaden my scope, I've never really warmed to British TV - the only show I actually make an effort to watch is Horrible Histories. 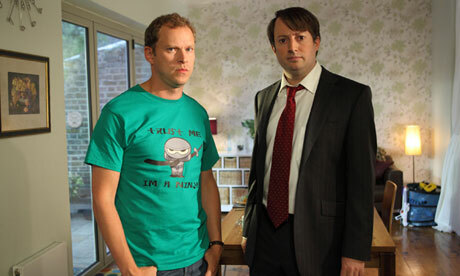 But (thanks to H's enthusiasm and expository comments) I was hooked on Peep Show from the first episode I saw, and quickly worked my way through the back seasons. Though some episodes and plots are more funny than others, it's the rare kind of sitcom that actually makes me laugh. Ever the Mark, I was anticipating Season 8 very cautiously - there's a huge potential for disappointment when a show resumes (like Vampire Diaries' subpar current season). But the two episodes so far were enjoyable and pretty promising. I appreciated the callbacks to some past storylines (Nana Chapman's cottage! The ideal naan : person ratio! Jez's chlamydia!) since I like it when a show keeps its stories straight. And while the "cringe-worthy humor" in Ricky Gervais' shows just makes me feel acutely embarassed, it works here (why it works is worth a whole essay, but it mostly comes down to how the characters are treated and depicted otherwise). However: I don't think the season is phenomenal so far. Episode 1 kicked it off well enough - though would Dobby really not care about dissipating mircowave radiation? H is in Dobby's field of work (IT), and he thinks it's an insult to his industry. More crucially, some of the material seemed vaguely rehashed, especially in the second episode. As other reviews have pointed out, the "Jez is encouraged to break taboos in the bedroom and suffers unpleasant repercussions" storyline has been done with Nancy (and I think his actual fantasy could have been a bit more transgressive to warrant the reaction it got, though it could be argued that its relative tameness made the plot work), and so has the "Mark sits bored in a club with his girlfriend's friends with whom he has nothing in common, which makes him wonder why he is with his girlfriend" plot. I'm also not sure if the show did the right thing killing off Gerrard in the first episode (especially after including him in the opening credits for that episode as a cruel tease). Not just because he's one of my favorite characters (he would be even if he weren't on Horrible Histories - I hope Jim Howick isn't going to take his slimmed-down self off that show too), but also because I hope the show isn't going to hurt itself trying to supercede this moment by becoming increasingly outrageous just for the shock value. But then again the show has seemingly scraped the barrell plenty of times (e.g. Jez eating the dead and partially burned dead dog of a girl he wanted to sleep with to cover up that he accidentally killed him; Jez believing that he'd run out of oxygen when locked in a hallway) without - so far - jumping the metaphorical shark. Ultimately, the season shows promise. Though it's a shame Olivia Colman's Sophie doesn't seem to be on board, Superhans - now a corporate sell-out (thus Jez) - continues be in close competition with Jean-Ralphio Sapherstein as my favorite recurring character on TV. I even think that Mark letting himself be roped into vanity publishing doesn't seem completely out of character. I can't help but see Mark as a tragic hero (mostly in the Millerian sense) with the prospect of seeing his book in print feeding right into his tragic flaw, blinding him to all reason. Plus, for the first time I noticed that Isy Suttie, the actress who plays Dobby, is surprisingly pretty (in towel and bathrobe) - the character's wardrobe and haircut dork her up well. Verdict: not as great as I'd hoped for so far, but I'm looking forward to episode 3. "The first thing is to acknowledge that the acient Egyptian era is so completely different from our own that any political or business parallels we draw between the two are, by their nature, almost bound to be wrong." - Mark, discussing his book (Business Secrets of the Pharaohs). Photos from The Guardian, which has a dedicated Peep Show section.